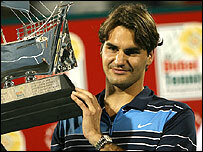 Roger Federer defeated Mikhail Youzhny 6-4 6-3 to win his fourth Dubai Open title in five years. It was the world number one's 41st consecutive victory stretching back to the beginning of the US Open in August. Youzhny, who upset defending champion Rafael Nadal in the quarter-finals, was seeking his second title in two weeks after winning in Rotterdam. Federer, who won his seventh straight title, was not to be denied and equals Bjorn Borg's run of 41 victories. The Swiss could equal Guillermo Vilas' all-time record of 46 successive victories in Indian Wells next week. John McEnroe, with 42 straight wins, and Ivan Lendl, with 44, are the more immediate targets in his sights. "It's nice to be playing against the history books," Federer, whose last defeat was to Britain's Andy Murray in Cincinnati, said. "I never thought I would ever do such a thing." Not for the first time this week, Federer got off to a sluggish start against Youzhny, dropping his serve in the opening game. But the Swiss held his second service game with an ace and then levelled at 2-2 when Youzhny hit a double-fault. As both players mixed floating shots with occasional power, Federer broke to take a 5-3 lead when Youzhny netted a backhand. Although Federer was unable to serve out the set, Youzhny dropped his serve for a third time when he netted a backhand approach. Federer then took advantage of his deflated opponent by allowing the Russian just three points in the opening three games of the second set. Federer failed to convert five match points on Youzhny's serve at 5-2, before finally clinching victory at the seventh opportunity. "I had a bit of a rough start here, struggled in the early rounds, and Mikhail made a good start and I had to react," said Federer, who was 0-2 down in the first set but has now won all nine meetings against the Russian. "But I am full of confidence and am on a great run. I did react and then my game came together nicely. "Of course I usually play well in Indian Wells, but I will have to be at my best (to equal the record)." Youzhny hopes his performances in Dubai will see him overtake his previous highest world ranking of 15.